Advanced Aeromedical, Inc. 800-346-3556. 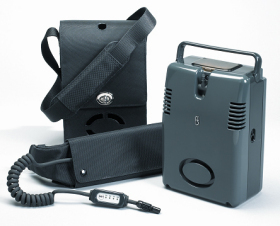 The AirSep FreeStyle is a small “Pulse-Delivery Only” FAA Approved Portable Oxygen Concentrator. It will provide oxygen at settings 1-3. Advanced Aeromedical, Inc. offers rentals of the AirSep FreeStyle Portable Oxygen Concentrator. Weighing 4.4 lbs, the FreeStyle is an “easy to travel with” solution to getting where you need to go while using oxygen. The unit sits in an inconspicuous carry bag that looks more like a camera bag than a piece of oxygen equipment. The FreeStyle offers pulse delivery oxygen settings of 1-3. The unit itself has an internal battery, at a setting of 2 the battery will last 2.5 hours. To extend your range, a battery belt that you wear around your waist is available. With the battery belt at a setting of 2, you can get up to 6 hours of battery time. We can have the AirSep FreeStyle shipped to your doorstep for an upcoming trip. Call us at 800-346-3556 to discuss different rental options. We also sell the AirSep FreeStyle. This is a great option if your looking for a portable oxygen concentrator to use for your portability needs. Also, if you have any last minute trip plans, already having a machine ready to go can be a valuable asset. If your thinking about investing in an AirSep FreeStyle, give us a call at 800-346-3556. We are here to assist.